NHLPA Goals & Dreams ensures the great game of hockey is available to as many children as possible, a priority to the players. Learn about the humble beginnings of the program in part one of this three-part series. Mike Gartner still remembers the day that Bob Goodenow walked into his office at the NHLPA one afternoon in 1998 with a unique request for the Hockey Hall of Famer. Goodenow, then the Executive Director and General Counsel for the NHLPA, wanted the former high-scoring forward to take a leading role in creating an impactful, player-driven, global grassroots hockey program. For a player who beat NHL goaltenders 708 times during his 19-year career – and still holds a league record with 17 seasons of 30 goals or more – Gartner was being asked to take his best shot at a different kind of goal. Shortly after joining the PA, Gartner got working on the interesting challenge that Goodenow presented him. “When I finished up my career and came on board with the NHLPA as director of business relations, we started those talks with the executive committee with Bob’s direction on how to do that. They were just conversations at that point. “When I started at the NHLPA, Bob just kind of threw it [a hockey program driven by the players] on my plate and said to come up with something, come up with ideas for this and we’ll go from there. Enter Devin Smith, currently the NHLPA’s Director of Marketing & Community Relations, who was working in the NHLPA’s media relations department at the time. The two men spoke about Smith coming aboard, and soon after the pair was in charge of navigating the unnamed program. “We initially decided we wanted to make a really big splash, so the decision was made to commit $15 million over five years. The second thing we needed to do was have a mission statement. It was between Devin and I. That would include coming up with a name for the program. Gartner and Smith didn’t have to look far for support on that front. “We did it internally,” remembered Gartner. “We had 50 people working at the NHLPA at that time. We sent out a little contest asking people to come up with names. We got some great ones. We had 30 or 40 to start with. We narrowed it down to five. And then we had voting as to what the name would be. 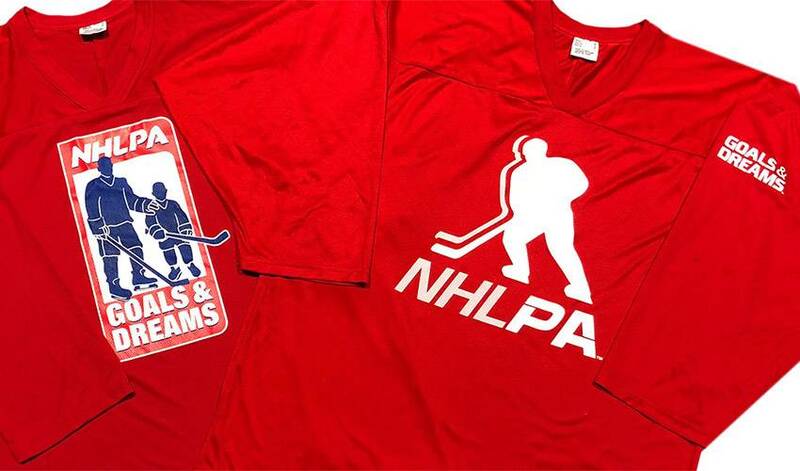 In 1999, NHLPA Goals & Dreams became a reality. From the very first day, one of sport’s most unique and impactful initiatives has had the players’ unwavering support. It’s also been guided and influenced by some of the game’s most respected stars on and off the ice: 1972 Summit Series hero, Paul Henderson; two-time Stanley Cup-winning forward, Adam Graves; former goaltender and current executive, John Davidson; Hockey Night in Canada host, Ron MacLean; Hall of Fame member, Eric Lindros; NHLPA Special Assistant to the Executive Director, Mathieu Schneider; NHLPA Divisional Player Representative, Rob Zamuner – in addition to a lengthy list of both former and current NHLPA members. “I remember early conversations that Devin and I had, wondering if anyone would apply, or would there be an overwhelming number of applications,” said Gartner. “We had press releases and did some publicity on it. And sure enough, the applications started flowing in. From humble beginnings, NHLPA Goals & Dreams has contributed more than $24 million to grassroots hockey programs and related causes around the world – nearly two decades since the program started as an idea within the PA offices.